Wow, 600 bag shots! Another milestone. And in honour of that we have a very special bag today. Dan K is back and with a spiffing bag for us. This one is a bit special and bigger than usual, with technical breakdowns and some shots taken with the setup. What else would you expect from Dan? Check it out. 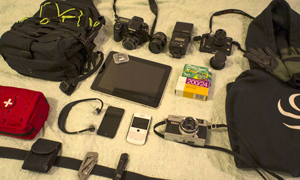 What’s in Dan K’s travel camera bag? Sometimes you can tell an old-school film photographer from a digital photographer just by the way he describes selecting his gear. I think this gives a lot of insight into how to use a film camera system to best advantage: A film photographer thinks first of the light, then the subject, then the film, the lens, usually a prime lens. The camera body is almost an afterthought. 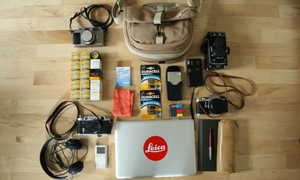 Compared to the film photographer, the enthusiast digital photographer has it back to front. He has invested in an expensive state-of-the-art camera body, then he throws in a few zoom lenses to cover (usually without gaps) the extremes of focal length, from super-wide to super-long. The light becomes the afterthought because the sensor and lens stabilisation can handle almost any light level, perhaps even below the level of human vision. Later, he might post-process a film filter over it for that ‘ authentic look’. Ultimately, the results may be similar given the application of sufficient skill, but the film process gives me more satisfaction, a higher keeper rate and the delay in seeing the results makes me a more critical editor than with digital. As I write this, I am embarking on a short trip to Taipei. I have no serious photography planned other than a few snapshots, mostly just of local life. The weather is hot and muggy. It’s the monsoon season, so I can probably expect a lot of overcast and rain. This calls for a sharp and contrasty 400ASA film, Kodak Tri-X (400TX), once the darling of photojournalists. 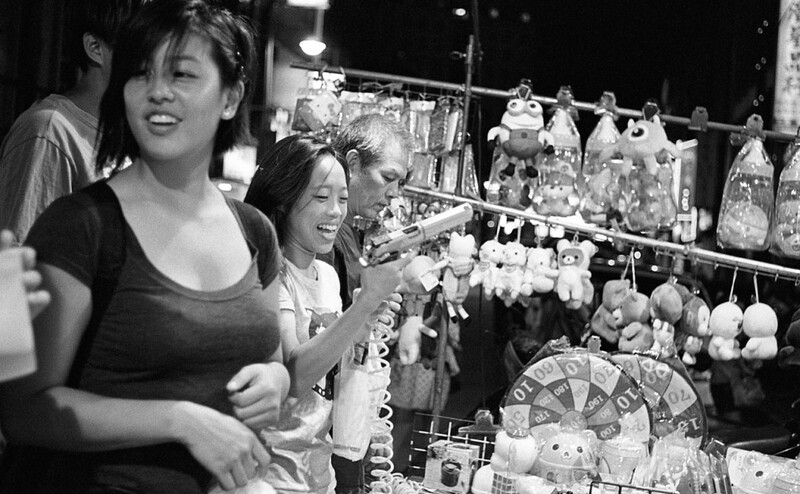 Tri-X is robust; it has good latitude typical of a black and white print film. It can be pushed and pulled a couple of stops; one stop under and I wouldn’t bother adjusting development time. In other words, it’s a do-all film. 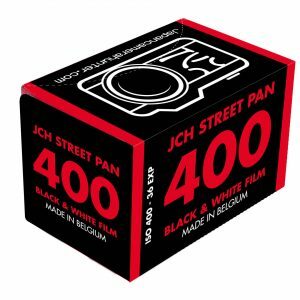 I use this film so much that I can almost previsualise the image. I also carry a couple of rolls of what I think of as ‘rescue film’, the equivalent to a golfer’s lob wedge and a narrow lofted 5-wood. These get me out of trouble with difficult light. 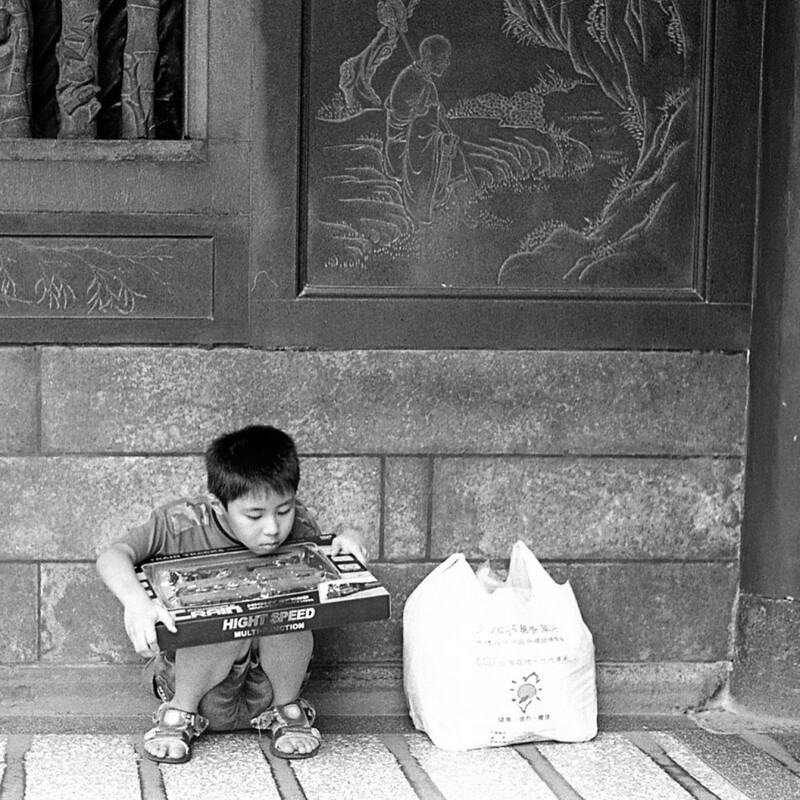 First, I picked Adox Silvermax. 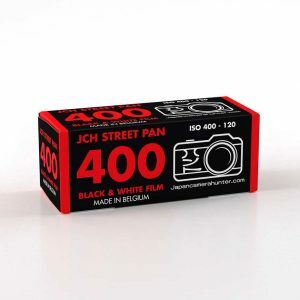 This is a 100ASA film for strong hard light with deep shadows. It avoids the necessity for pulling and fill flash. A high silver content gives it great DMAX, so it simultaneously preserves details in shadows and highlights. Latitude is extreme; I am yet to find its limits. It almost doesn’t matter what exposure you use it at. It makes a hero out of idiots like me. If my meter fails, I’ll load up Silvermax and eyeball the approximate exposure and trust in the latitude. My other rescue roll is FujiFilm Natura 1600. Theoretically, I can shoot it at up to 3200ASA and even higher by pushing, but it delivers best colour saturation and contrast at 400-640 ASA. Being a colour film, if I find myself in a situation with good colour but poor tonal contrast, it’ll make for a more compelling image. The next step is to pick a suitable lens. I like to travel light. 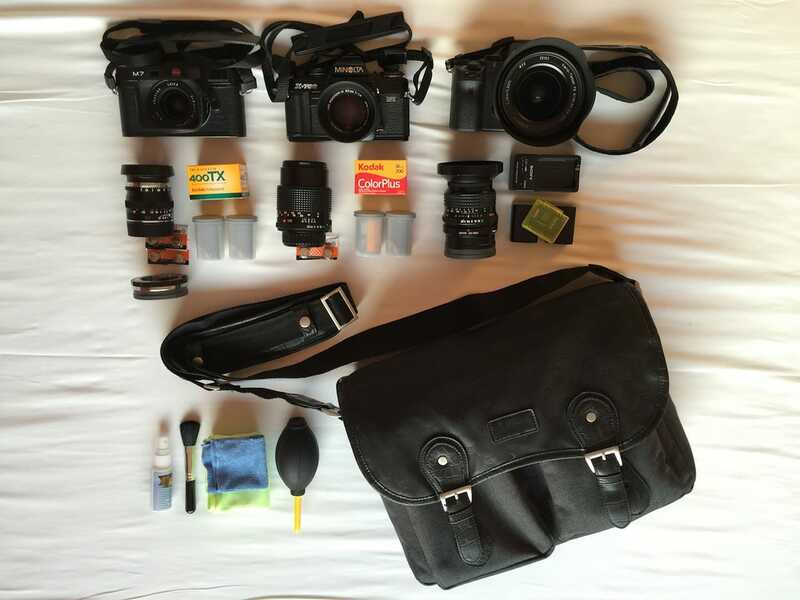 I am not going on a long trip and I don’t plan to photograph something specific requiring specialist gear, I just plan to take holiday snapshots and do a little street photography in my spare moments. Therefore, I don’t need a telephoto lens, I don’t need a particularly wide lens, a tilt-shift, a fish-eye, nor a big, heavy wide aperture lens. I certainly don’t want to be carrying multiple lenses and fumbling to swap them when I should be already composing and shooting. What I need is a compact and lightweight prime lens that’s sharp, fast enough, and renders reasonably well. Normally, when I do street portraiture, I choose a 28mm or 35mm wide lens when used on a rangefinder, but I prefer an SLR with a normal lens for travel; it’s simply more of an all-rounder. The lens I chose is an AI converted Nikon GN Auto Nikkor C 1:2.8 f=45mm. It was a very deliberate choice. First off, it’s a pancake lens, which is more or less as small as they come. I can slip my camera with lens attached into my hip pocket, yet the dials on this particular pancake are substantial and easy to use, unlike the fiddly Olympus OM, for example. The second reason I picked it over the other Nikon pancakes like the 45mm f/2.8 P and 50mm Series E is this one’s the best built and more likely to survive a fall. It’s also the best regarded optically, with a sharp tessar optical design and seven bladed iris, although I can’t say I can tell the difference in the print. Unusually, the smallest aperture is f/32, which is useful for shooting 400ASA film with flash. The focus has a reasonably long throw but it’s light and fast. Bizarrely, the focus direction is the wrong way round for a Nikon. It’s no problem; I use several other camera systems so it’s easy for me to adjust my muscle memory. There’s a good reason for the reversed focus dial direction: this is the only SLR lens I know that can directly couple the aperture to the focus dial. Why is the lens’ focus dial reversed? The answer is guide-number flash exposure control, hence the “GN” in the lens designation. In the 1970’s thyristor auto-flashes and Through-The-Lens (TTL) flash metering hadn’t been invented and some of the better rangefinder cameras of the day used this trick to adjust the aperture for the correct exposure for a manual flash. As the subject distance decreases, the aperture is stopped down because the flash bouncing off the subject is less. 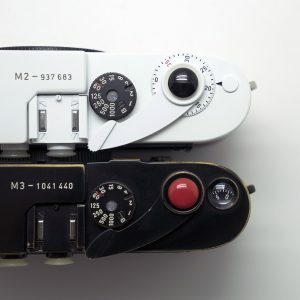 The most advanced example was the Konica Auto S3, which had two needles, one showing the flash-based aperture and the other the setting that would be required to balance ambient light. Want to balance the light? Easy! Want to have the subject one and a half stops above the background? Easy! Any lens with adjustable focus and flash can do this, but this lens means you don’t have to do any mental math and twiddle the aperture dial between focussing and hitting the shutter. I know many digital photographers don’t care for flash, especially on-camera flash, but in film’s heyday, it was de rigour. I’m mostly using good old Tri-X 400ASA. I really don’t like pushing Tri-X more than two stops, which gives me a lowest usable light value of about LV4. With a flash, I get perfect exposure even in pitch blackness out to about 10m without pushing the film. The flash unit I chose is a Nikon SB-18 Speedlight. The main reasons I picked it is that it’s small, light, reasonably powerful and runs of four AA batteries for a quick cycle. The flash charges to full power in about a second with NiMh rechargeable batteries. The SB-18 has a handy TTL range table on the back as well. Although the lens offers GN-based flash exposure control, it doesn’t hurt that the SB-18 offers the more advanced TTL flash exposure control with compatible Nikon cameras. TTL discharges just enough light to expose the film and measures this through the lens. There are times when TTL might be preferable to GN exposure control. One example is shooting a close subject with a wider aperture and needing just a bit of fill flash. You can’t do that with GN, because the flash if fired at full power. GN has a different look, dropping background illumination, but giving more depth of field with closer subjects. In summary, TTL lets you shoot close and dilated, but GN rocks for reach. It’s the “Artsy” vs “Weegee” looks. By “Artsy” I mean balanced ambient with wide aperture, and by “Weegee” I mean the look of the press photographer Arthur Fellig whose Speed Graphic and powerful flash so defined 30’s and 40’s press photography with a brightly lit subject and a darker background. You can also combine the two techniques. Couple the focus at a wider aperture and use TTL for an intermediate effect. Another advantage of TTL is it should give faster cycle times and longer battery life, because it can discharge less than a full capacitor’s charge. Other situations where TTL works and the GN approach does not is using bounce flash with a tilt-head, off-camera flash, multiple heads, modified or gelled flash, or where you have a nearby reflective surface that reflects spill. GN does not factor for these, but TTL doesn’t care. All that matters is the amount of light that comes back through the lens. Where TTL metering falls down is photographing subjects that are very light or dark in shade, or small objects surrounded by dark or distant backgrounds and possibly also off-centre subjects. Here GN flash calculation saves the day. 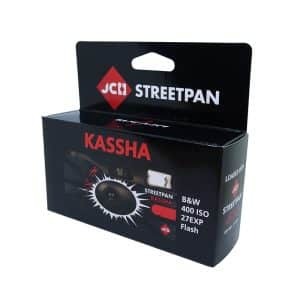 It also works with flash bulbs, fixed power flashes and other non-TTL on-camera flashes. 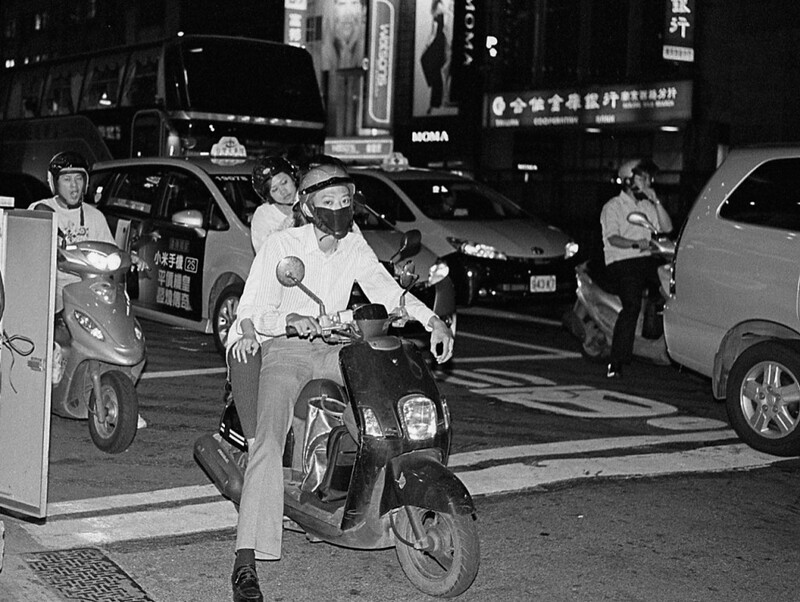 Allow me to summarise my flash strategy by saying that in low light, negative film can be underexposed a stop, or pushed a bit further, but you’ll often get better results with flash. There are situations where either guide number calculations, or TTL will yield better results and a competent film photographer should be familiar with both techniques, know when to use each one and what the results may be expected to look like. 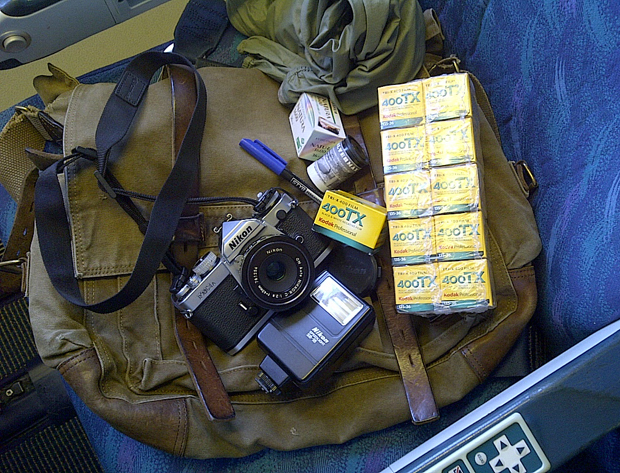 The SLR body that I picked is the Nikon FM3A. In a recent article on JCH I named it as my favourite SLR of all time and a perfect travel companion. It’s small, has a good finder, and is very well built, with reliable workings. As my only camera, reliability is critical. For convenience and confidence, the FM3A provides aperture priority automatic metering, with shutter speeds indicated by a needle in the finder. It offers metered manual exposure, but unlike full-electronic cameras like the Nikon FE, if the batteries fail on the FM3A, the manual shutter speeds are mechanical. 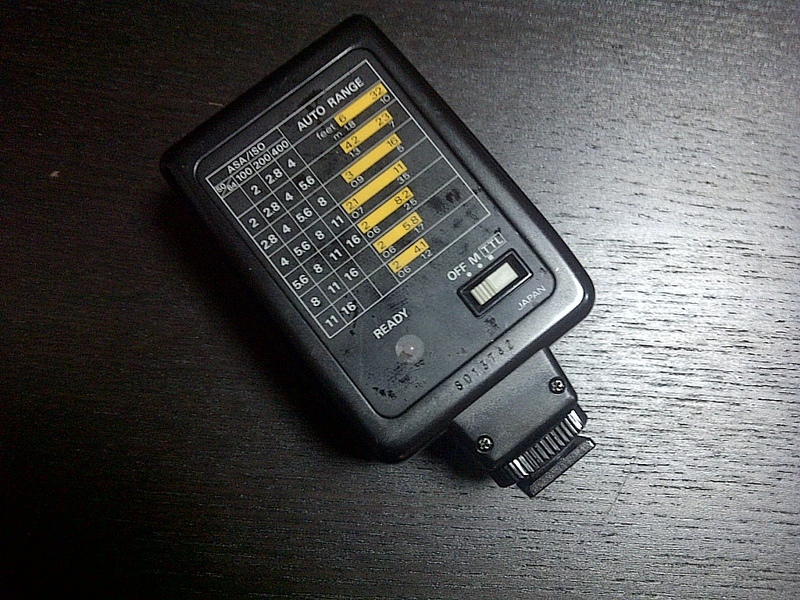 Of course I carry spares and besides, the two LR44 alkaline cells are easy to find, being commonly used in clocks and calculators. Some cameras have only one back-up mechanical speed, but the FM3A will operate at all speeds. If I was using a camera that offered just one back up mechanical speed, such as what Nikon labels “M90” (1/90s), I would try to eyeball the light level and rely more on film latitude and/or GN coupled flash exposure, both of which are battery independent. Even when the meter is working, I often use manual exposure. Doing so gives me faster control over exposure when the light demands exposure compensation and isn’t limited to +/- 2 stops like the exposure compensation dial. The FM3A has metered manual mode which means I see a blue tab that indicates the shutter speed I am on and the meter needle continues to indicate the light level suggested by the meter. Metered manual is also how you should shoot flash. Just like the aforementioned Konica Auto S3, it shows you how much the flash will be brighter than ambient light. It even allows you to balance the light levels to your taste. Just don’t go faster than the maximum X-sync speed of 1/250s, or the flash exposure won’t come out right. 1/250s is actually pretty fast, faster than my Canon DSLR. The FM3A works very well with the rest of the system, especially the flash. It takes advantage of TTL and even has a dedicated button to press that will give a one stop under exposure of flash. This is used for fill flash. With a very high shutter speed of 1/4000s , I can use high speed film in bright daylight and combined with the f/32 minimum aperture, it gives me almost total control over the lighting balance of flash vs ambient light. The finder doesn’t match some of my other cameras for magnification and coverage. The magnification isn’t bad though and incomplete coverage has saved me on several occasions where I would have cropped too tight. The focussing screen is one of Nikon’s better ones. In addition to ground glass, there is an effective microprism around a split screen. The split screen doesn’t black out. To be fair, while I can live with the reversed focus dial direction, this lens isn’t the easiest one to focus on this camera, despite the high quality prism finder and screen. My habit with rangefinders and SLRs is to prefocus the lens using the distance scale to between 2m and 5m and then only fine tune the focus in the finder. Sometimes I don’t have the time to fine tune if the decisive moment is already upon me. I also tend to stop down to between f/8 and f/11 whenever possible. If the image is well composed, I don’t need to depend on shallow depth of field to show the viewer where to look. Also, when I use flash, the tonal balance achieves background separation. There is circle in the centre of the finder that helps with rule-of-thirds composition and indicates the area biased be the centre-weighted meter. An AE lock button will lock this exposure in to allow re-composition. 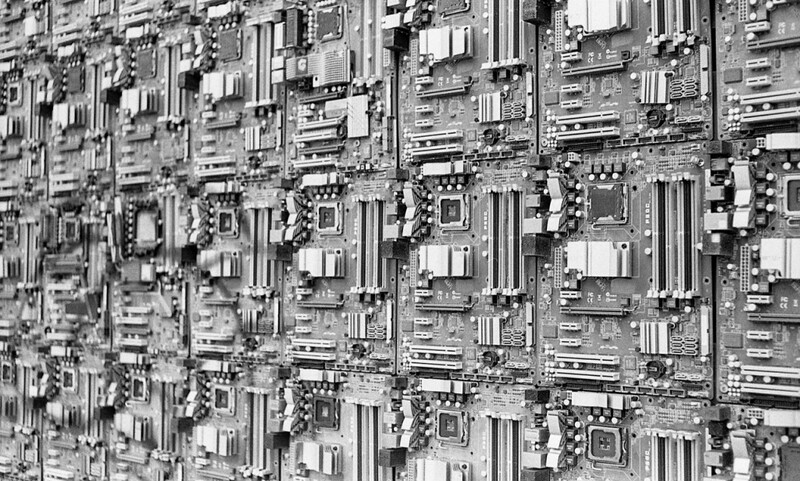 To describe the system as a whole, it is small, light robust, fast and automatic, yet offers more deliberate creative control than a modern camera system. To be critical, there are a few small flaws, but none fatal. The lens is an AI conversion, rather than a native Nikon AI, so it doesn’t display the aperture setting in the finder. It’s no big deal. Also, there is no depth of field scale. 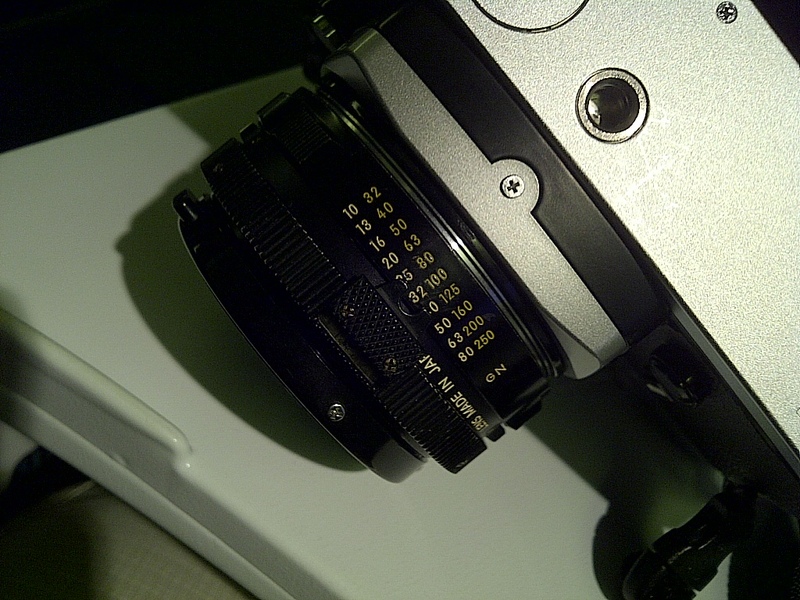 I have a pretty good idea of the depth of field for a normal lens and there is a DoF preview button on the FM3A. The metering is simple centre-weighted average and there is no multi-segment matrix metering, highlight priority, or spot metering. My selection of print film renders this problem moot. Despite the small, light flash, the small light body and small light lens aren’t enough to counter balance it and the whole set tends to hang inverted. I quite like this carry; I sling it over one shoulder and it hangs over my right kidney, concealed but accessible. For completeness, I’ll discuss the other elements in the bag shot. The strap is a Cam-in brand strap. It is the perfect width and strength to suit the system. It is removable in under 5 seconds and slips into a pocket when not needed. There are no metal parts to rub on the camera, not even lug rings. The strap is a tapered tube with no seams or edges to fray, nor stitches to fail. The marker pen is to mark film cans for notes and special processing instructions. I also use it to give out my contact details, which I write on film tabs torn of film boxes. I pass them out like business cards to anyone I meet with an interest in my photography. The bag is a Belstaff 556 modified to use old style buckle-down straps rather than pathetic magnet closures. The camera and flash fits in one front pocket and the film in another. I put a folding umbrella in one side pocket and the light windbreaker in the other side. I carry a Montane Pertex Microlight jacket that is somewhat water-repellent and lightly windproof. A jacket beats an umbrella for light drizzle because it leaves the hands free to work the camera. It packs smaller than a tennis ball and weighs next to nothing. There is an internal zipper pocket in the bag for small loose items like spare batteries, leaving the main section free for carrying whatever else I need to bring on the day or carry home. So there you go, it’s a simple one-camera, one-lens traveller’s bag, but one that almost perfectly suits my style of working and the light, subjects and scenes that I expect to encounter. It pays to check your kit before you travel, especially if you are travelling light. Being a numpty, I didn’t notice until I was on board the plane that the lens’ iris was sticking and was reluctant to stop down further than f/11 and did so only very unreliably and inconsistently. Considering that my SLR meters ambient light levels wide open and adjusts the shutter speed to match the aperture diameter that it believes the iris will be open at, this would cause over exposure at settings narrower than f/11. Luckily, the FM3A’s top shutter speed is a blistering 1/4000s which meant I could still use the camera with relatively fast film outdoors in the daytime. Furthermore, print film’s generous overexposure latitude gives additional comfort. Nevertheless, the lack of usable narrow apertures meant that I was not able to rely on GN coupled flash metering for close ups. Having TTL flash was just the braces I needed to keep my pants up when the belt buckle failed, to abuse a metaphor. I have actually few flash images to show you. Partly this was a result of my reluctance due to the lens’ mechanical fault. However I prefer tend to use flash sparingly, in circumstances when flash is definitely required. The other sample images from my trip show a variety of lighting conditions, many of which had somewhat challenging lighting for one reason or another. When one attains a reasonable level of experience with film, flash and photography in general, there are many different ways to deal with tricky light. The variety of techniques results in many alternate interpretations of a given scene. 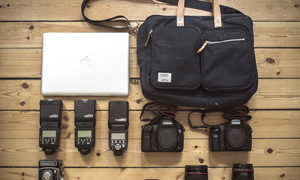 You don’t need to carry a lot of different gear to achieve your chosen artistic vision. First of all a huge thank you to Dan for providing us with this bag shot. It really raises the bar on what you can include in your bag shots. Wonderful stuff. And also a huge thank you to you all who read and who have participated. I could not have done this without all of you. There’s nothing like travelling to a new location to get the creative juices flowing and I came back from this trip with lots of great images. Many more will be posted to my tumblr account given above in the coming few days. I’d like to thank Bellamy for the honour of being your 600th In Your Bag. This series is proving to be an excellent window into many individual photographers’ work and philosophy. I wasn’t particularly trying to raise the bar; a long article inevitably results from my getting trapped on a flight for a couple of hours without internet access. Indeed some of the best best In Your Bags have been a simple photo, a few words and a link to the artist’s gallery. Thanks for all the great info! Looks like an efficient travel setup. You explain the mental gyrations that we, as film photographers, go through. July 2011, I got to check off a bucket list item, photographing a Space Shuttle launch. I did my research, but everything was geared towards digital photography. I emailed a Florida newspaper that covered Space Shuttle launches and told him of my gear inventory. He said “The Canon A-1 is a classic camera” and suggested using ISO 100 film, underexposing it by 1/3 stop. Finding ISO 100 film in my city turned out to be a scavenger hunt, but I found Kodak Ektar 100 at a store shortly before it closed for business. I was also given the tip to mount my camera “backwards” on the tripod so that the tilt handle was under the lens and that it wouldn’t impede the progress of tilting upwards. Then, I got the unprecedented invitation from NASA to view the final Space Shuttle landing. 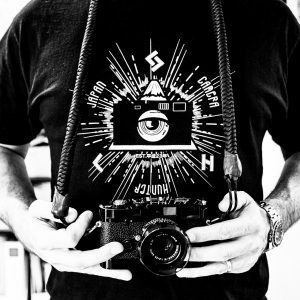 I would’ve liked to order Kodak TMAX 3200, but it was the Jewish Sabbath when I got the email. Since Atlantis was a pre-dawn landing, B&W should be good and I bought Kodak BW400CN to push to 1600. I still had Ektar 100 loaded in my camera. I had frames of Ektar 100 to burn in the pre-dawn hours; surprisingly, they came out well in the parking lot, and press office for credentialing. 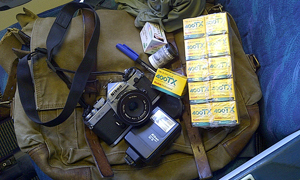 Paying for express delivery of TMAX 3200 would have tripled the cost of the film; but in hindsight, I should have. ISO 1600 was just too slow to freeze Atlantis. That’s a great story, Ralph. Thanks for sharing it with us. 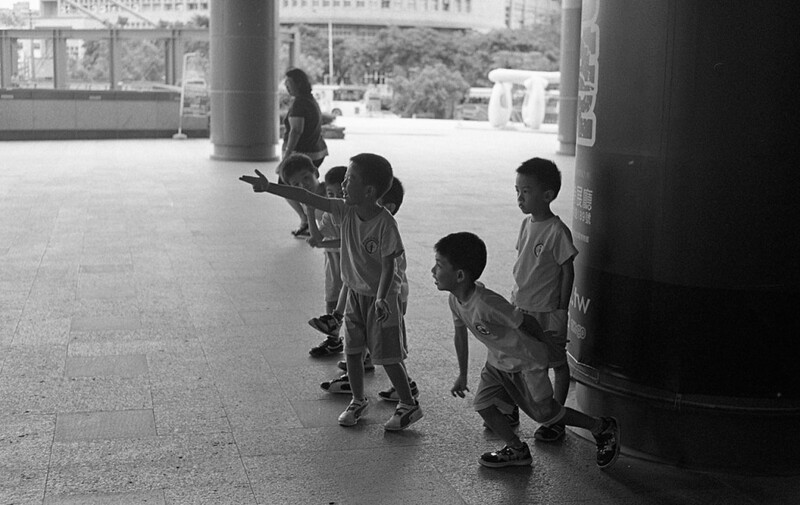 I would prefer grain to motion blur, so I might have pushed the film if the base ASA was too slow. However, this is a situation where digital cameras outperform film and I would feel no shame reaching for a digital body. Incidentally, given today’s image stabilisation technology, you can almost ignore hand shake, even for relatively long lenses. It is then possible to calculate motion blur based on the object’s tangential trajectory, distance, velocity, shutter speed and circle of confusion. Perhaps there is an app for that. The old-school approach was to simply practice panning till it was second nature (and fire off a burst of spray and pray).